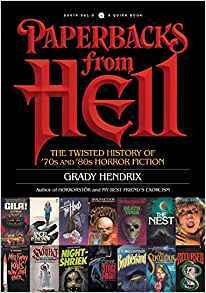 Paperbacks from Hell: The Twisted History of ’70s and ’80s Horror Fiction, Grady Hendrix (Quirk Books 978-1-5947-4981-7, $16.95, 256pp, tp) September 2017. Looking over the colorful cover repro in Paperbacks from Hell, Grady Hendrix’s compulsively readable history of mass-market horror paperbacks in the ’70s and ’80s, is a bit like rummaging in your clothes closet and running across that pair of paisley bell-bottoms you wore to death in the late ’60s. You’ll imme­diately be swept up in a wave of nostalgia for the time and associations that it evokes. You’ll also cringe a little at the memory. For horror readers who remember those de­cades, Hendrix’s book is an unapologetic wallow in the golden age of horror paperbacks and their garish cover art. For readers who were too indif­ferent, or who were born too late to appreciate the cheesy charms of pulp paperbacks at a time when “horror” was evolving as a modern marketing category for what had hitherto been imperfectly tabbed as “gothic” or “occult” fiction, the book provides a potted history of horror publishing in the late twentieth century, before the genre imploded and later rose from the ashes of its mass-market incarnation to become the niche market it is today. Hendrix’s historical assessment follows the well-trod path of other critical analyses of horror’s emergence, following the rise of the immensely popular gothic romance market in the 1960s and early ’70s. Nurtured in the cul­tural mulch of social and political upheaval at the end of the Vietnam War era, horror hit the trifecta between 1967 and 1971 when Ira Levin’s Rosemary’s Baby, Thomas Tryon’s The Other, and William Peter Blatty’s The Exorcist all charted on the New York Times bestseller list, the latter two simultaneously. 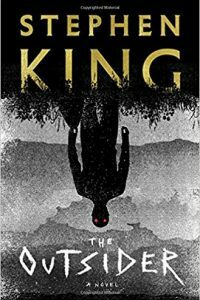 Less than three years later Stephen King would publish Carrie, and although he would not become a hardcover bestseller until The Shining was published in 1977, the lid to the Pandora’s box of possibilities for horror fiction had clearly been forced open. The difference between Hendrix’s book and other histories of modern horror is the sheer profusion of cover art images he deploys to back up his assertions about the gonzo direc­tion paperback publishers took in response to this potentially lucrative new market, in order to craft a distinctive look by which consumers could instantly recognize a book’s horror con­tent (often not evident from the vagueness of its title) from its cover design. Early books, keying on trends implicit in the hardcover bestsellers, initially were decorated with imagery that sug­gested Satanism and cults. With the proliferation of books written to capitalize on this burgeoning market, paperback publishers seemed to ask their art directors to proceed in one of two directions: cloning effective covers that had already attracted a readership, or imposing some outlandish twist on the design that would raise – or perhaps lower – the bar for future covers. And so we see all the tricks of the trade that publishers used to make their books shout “Me-me-me-me-me!” from the paperback racks: foil embossed titles with dripping letters, die-cuts with “gotcha!” show-through art, gatefold covers that doubled the span of their eerie-looking real estate, holographic tip-ons that morphed normal-looking faces to horrors dripping with ne­crotic ooze when tilted just so in the light. And of course, there are the cover images themselves: satanic children, sacrificial victims on altars in semi-pornographic repose, packs of shrouded cultists, dolls with cracked porcelain features, creepy clowns, rampaging giant critters, and skeletons decked out in every possible form of professional and casual attire. Hendrix doesn’t just cherry-pick the lowest-hanging fruit for his cover critiques: he gives illustrative sidebars to Jill Bauman, Jeffrey Catherine Jones, Rowena Morrill, Lisa Falken­stein, and other distinguished artists whose work was widely imitated and bastardized by lesser talents for decades. Not everyone will remember the history of mass-market horror fiction exactly as Hendrix recalls it. In his last chapter he discusses the eruption of splatterpunk in the late 1980s and the subsequent rise of serial killer fiction following the success of Thomas Harris’s Red Dragon (and later, The Silence of the Lambs) and the celeb­rity of its psychopath poster boy Hannibal “The Cannibal” Lecter, as though they were causes rather than symptoms of the horror mass market’s decline in the 1990s. Hendrix describes splatter­punk as a “movement,” but in truth it was a label for a style of visceral fiction that only a handful of writers used to promote their writing, and it was no more an actual movement than dark fantasy and the style of “quiet horror” it represented – and that the splatterpunks posed themselves as in opposition to – was a movement. Granted, the noise attending splatterpunk appears to have persuaded some writers who were then coming up through the small press and still finding their voices to embrace its sometimes gratuitously gory boundlessness, but it’s not fair for Hendrix to generalize the fiction as being “powered by a rejection of literary style.” Part of what made the fiction of David J. Schow, John Skipp and Craig Spector, and other self-proclaimed splat­terpunks impossible to ignore was its balancing of graphic content with a style that transcended its explicit expression. (And not every author who worked with explicit content at the time merits the splatterpunk label: it might surprise Billy Martin [AKA Poppy Z. Brite] to see his sexually frank gothic fiction lassoed by Hendrix into the splatterpunk corral.) A considerable amount of splatterpunk fiction was more artfully written than the potboiler novels whose covers gave hor­ror its generic look during the period. Ironically, for all of their gore and violence, splatterpunk novels usually got cover art no more outrageous than did books of milder horror fare. The collapse of mass market horror in the 1990s had less to do with the changing aesthetics of the fiction than it had to do with market factors. 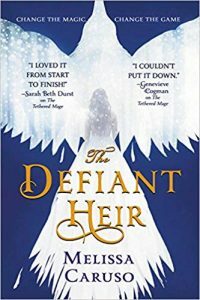 Publishers with horror lines had greatly overesti­mated the salability of their cookie-cutter genre fair and it was foreordained that the books with which they flooded the market would hit a satura­tion point. Paperbacks from Hell celebrates that giddy moment before the horror mass market’s final reckoning, when publishers were engaged in a perceived dynamic with readers to provide them with the same fare that had sustained them all along, but distinguish it as new and different by means of its attention-grabbing cover art.